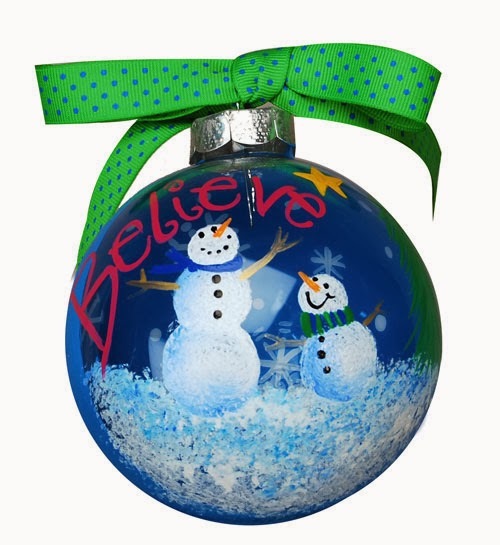 Lighten and brighten your holiday tree with this glossy ornament painted with a snowy scene. Hand-painted christmas ornaments make great holiday gifts. DAG01 - White --- NEW!! DAG36 - True Blue --- NEW!! DAG71 - Glorious Gold --- NEW!! DAG151 - Royal Fuchsia --- NEW!! DAG228 - Bright Orange --- NEW!! DAG230 - Festive Green --- NEW!! DAG234 - Calypso Blue --- NEW!! DAG273 - Saffron Yellow --- NEW!! Preparation: Clean ornament with alcohol. Dry well with paper towel or soft cloth. Use liner brush and White to paint snowflakes and dots on one side of ornament. Use cosmetic sponge to apply Calypso Blue over snowflake area leaving front portion of ornament unpainted. Use sea sponge with White and small amount of True Blue to pounce in snow area. Dip largest pouncer in White then dip edge in small amount of True Blue. Tap on palette to blend. Position pouncer on ornament and press to form snowman body. Repeat with remaining pouncers. Use liner brush and Festive Green to paint tree and scarf, Saffron Yellow for star, True Blue for remaining scarf, Bright Orange for noses, and Glorious Gold for arms. Use brush handle end and Black to dot on eyes and buttons. Use liner brush and Royal Fuchsia for lettering.